The content of this article provides interesting history, facts and information about Gladiator Schools in Rome. The gladiator schools in Rome also served as barracks where gladiators lived between their fights. The first Roman Gladiators were prisoners of war and were named according to their ethnic roots such as Samnite, Thracian and the Gaul (Gallus). Two of the Gladiator schools in Rome were also named accordingly. The Ludus Gallicus for Gallic gladiators of Gaul and the Ludus Dacicus named for Dacia. All of the Gladiator Schools in Rome were in extremely close proximity to the Roman Colosseum. In fact the Ludus Magnus the great Gladiator School was connected to a tunnel which led directly to the Gate of Life in the Colosseum where the gladiators would have made their entry. The Ludus Magnus was located in a building just outside the Colosseum and the building next to it was the the Bestiaries School, the Ludus Matutinus. The history of the Gladiator Schools in Rome is highlighted by the building of the four great imperial schools of gladiators in Rome. The schools were commissioned by the Emperor Domitian, who reigned from 81 AD to 96 AD, shortly after the Roman Colosseum was built in 80AD. All of the gladiator schools were located very near to the Roman Colosseum. Each gladiator school in Rome had an arena, similar to that of the the Colosseum, but smaller. The arenas in the gladiator training schools of Rome were surrounded by raised seating, the largest, the Ludus Magnus, held 3000 spectators. Many Romans visited these training schools when there were no gladiatorial games being staged at the Colosseum. The arena was the centre of the school complex. At the rear of the seating area was a portico that opened onto the gladiator’s cells. The gladiator's cells were 2/3 storeys high. The gladiators slept in cells, often two in a room. There was accomodation for the slaves and staff who worked in the Gladiator schools and also rooms where the training equipment was kept, baths, a mess hall and kitchens. The Bestiarii gladiators were trained in specific schools who specialised in fighting wild and exotic beasts. The schools were called the scholae bestiarum or the bestiariorum. The Bestiaries School in Ancient Rome was called the Ludus matutinus, which was a building situated adjacent to the Roman Colosseum which was established by the Emperor Domitian. The name of the school, Ludus matutinus, is derived from Latin word matutinus meaning "of the morning" which was when the animal, or wild beasts fights, were scheduled. The types of gladiators who trained in this school were Bestiarii (Beast Fighters) and the Venatores (Wild Animal Hunters). The Ludus Gallicus was the smallest of the gladiator schools and specialised in training gladiators who were heavily armored which focussed on the training of first the Gallus Gladiators and then incorporated the Samnite gladiators. 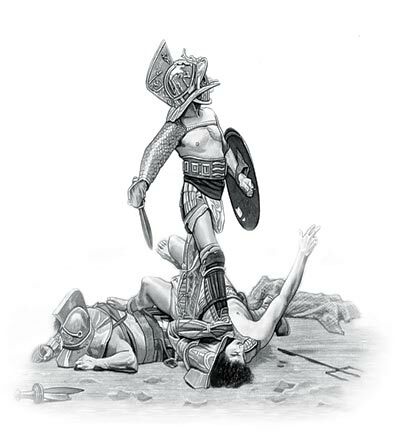 The other heavily armed types of gladiators such as the Murmillones and the Hoplomachi soon followed. The inhabitants of Dacia are generally considered as belonging to the Thracian nations. The Thrax or Thracian gladiators and the Dimachaerus gladiators used a sword called a sica, or siccae, which was a short, curved sword, with a blade about 16-18 inches long. This was the most common type of Dacian sword. The Dacian School (Ludus Dacicus) was built near the Baths of Trajan in Rome. The content of this Gladiator Schools in Rome category on life in Ancient Rome provides free educational details, facts and information for reference and research for schools, colleges and homework. Refer to the Colosseum Sitemap for a comprehensive search on interesting different categories containing the history, facts and information about Ancient Rome. Just like the subject of Gladiator Schools in Rome there is hardly a page of Roman history and the Romans that is not, on some way, connected to the Roman Colosseum which became a symbol of Rome, its society, culture and life.